In 1989, I bought a compilation cd of rock-oriented tracks called 'Empty Rooms'. It was full of tracks I knew well and wanted to have on cd. 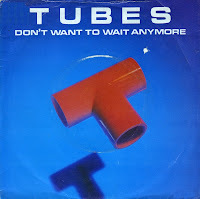 One of these tracks was the lesser known 'Don't want to wait anymore' by the Tubes. I think I loved the track straight away. The Tubes were based in San Francisco and primarily made rock music. In the UK, it reached the lower regions of the single schart in 1981. It was their third and final chart single in that country.